STATE CHAMPIONS 2018! Photo by B. Butler Danes. Things weren’t looking good for Old Lyme five minutes into their championship game against Immaculate when their opponent scored off a penalty. But (Paul) Gleason’s girls aren’t ones for getting despondent or worse still, giving up. No, Mya Johnson went on to score her 100th and 101st girls to lead the Wildcats to a 2-1 victory over their arch nemesis. CONGRATULATIONS TO THE GIRLS, COACHES AND PARENTS! 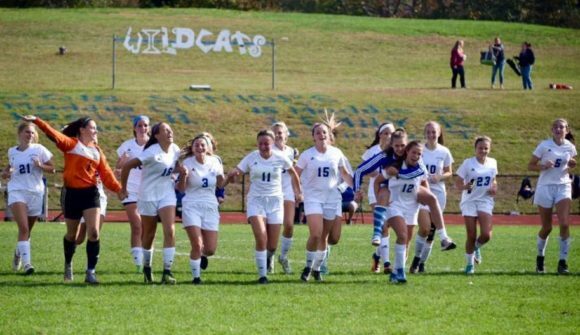 The Wildcats celebrate their 3-1 victory over East Hampton in traditional style. Photo by Jennifer Alexander. 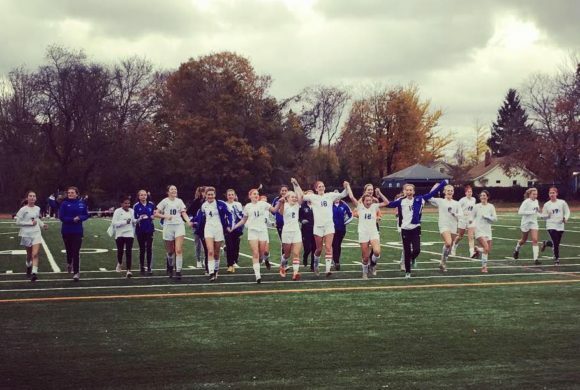 11/16 UPDATE: Due to the anticipated inclement weather Saturday, the CIAC Class S state final has now been rescheduled to Sunday, Nov. 18, at 5:30 p.m at Middletown High School. 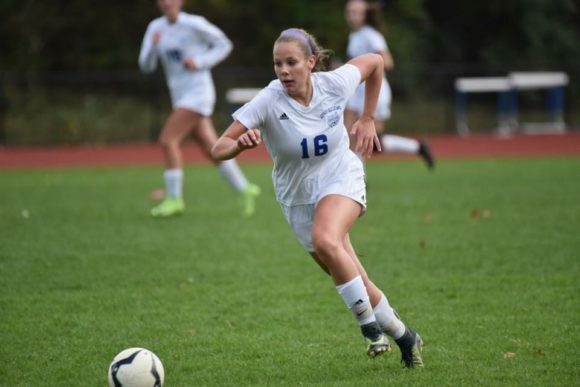 11/15 UPDATE: The final will be played Saturday at Middletown High School at 3 p.m.
Mya Johnson put the ball in the net three times last night in Old Lyme’s Class S CIAC semifinal against East Hampton. Her hat-trick takes Paul Gleason’s girls into the state final for the fourth time in as many years. Gleason’s girls respond to the thrill of the final whistle! The final against Immaculate will be played on Saturday at a location and time to be announced. Editor’s Note: Read a full report by The Day’s Vickie Fulkerson, which was published Monday evening, at this link. Mya Johnson scored the first goal for Old Lyme in Thursday’s game against Cromwell. 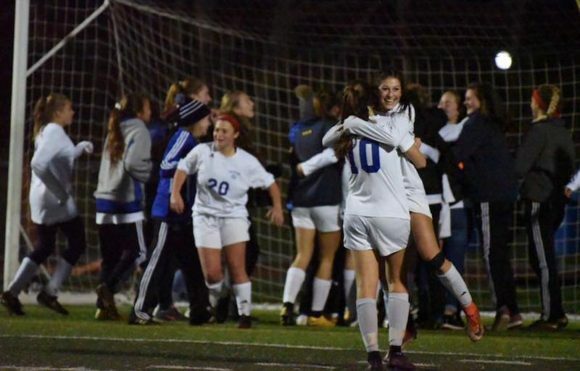 File photo..
Old Lyme won 2-1 yesterday in the second round of CIAC State Tournament defeating Cromwell, to whom they had previously lost in both the regular season and conference playoffs. Mya Johnson was the first to score for the Wildcats off an assist from Kaylee Armenia. Old Lyme led 1-0 at halftime but Cromwell tied the game up at 1-1 at the 28 minute mark after a goal mouth scramble. Britney DeRoehn scored the game-winning goal unassisted with 6:20 minutes left on the clock. Sam Gray was in goal for Old Lyme and had seven saves. Jessica DellaRatta was in goal for Cromwell and notched 16 saves. Old Lyme now faces Portland in the quarter finals at the of neutral site Old Saybrook High School this afternoon at 2 p.m. The Old Lyme girl’s soccer team lost to Morgan 0-1 at Indian River in Clinton on Monday evening. Taylor Maher was the lone goal scorer for Morgan. In goal for Old Lyme was Sam Gray with three saves while Rebecca Cockley made eight saves for Morgan. Old Lyme is now 7-4-4 overall and 5-3-3 in the Shoreline Conference. LOLHS Varsity volleyball team members Leah Fouquette (right) and Katelyn Wells model the Superman shirts, which will be on sale tomorrow evening at the Volleyball fundraiser in memory of Leah’s late father. Tomorrow, Wednesday, Oct. 10, the Lyme-Old Lyme High School (LOLHS) Girls’ Volleyball team will host a fundraiser to honor the memory of Joe Fouquette, who passed away this summer after a long battle with thyroid cancer. Mr. Fouquette’s daughter Leah is a varsity player for the volleyball team, so the players want to support her and her family in any way they can. 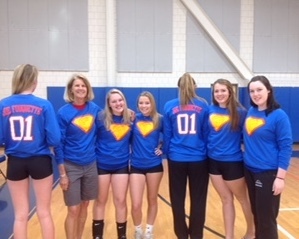 The whole volleyball team and their coach Ms. Beth Schreindorfer (second from left) will be participating in tomorrow evening’s fundraiser. Every year, the volleyball team holds a fundraiser where all the proceeds go towards a designated cause. Because October is Breast Cancer Awareness Month, usually the money raised goes to support breast cancer research. But for the past few years, the team has dedicated the night to causes that are a little more personal for them. Junior Katelyn Wells lost her mother during the summer of 2017, and the team hosted Pass the Love last season to remember Katelyn’s mom, Kathy Wells. This Wednesday, everyone is welcome to attend Superman Night, so named in recognition of Joe Fouquette’s nickname. The Junior Varsity game starts at 4 p.m. and the Varsity game will start around 5 p.m. in the LOLHS gym. The volleyball team have been working hard to publicize their fundraising event. 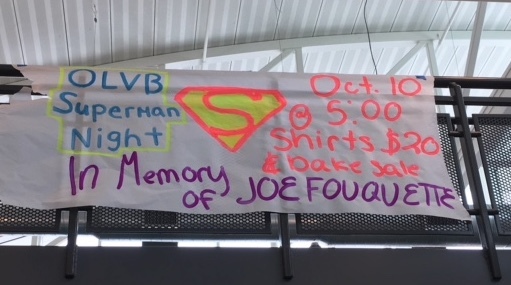 There will be pizza and baked goods available for purchase during the game as well as Superman shirts to honor Mr. Fouquette’s legacy. All of the proceeds will benefit a college fund for Leah. 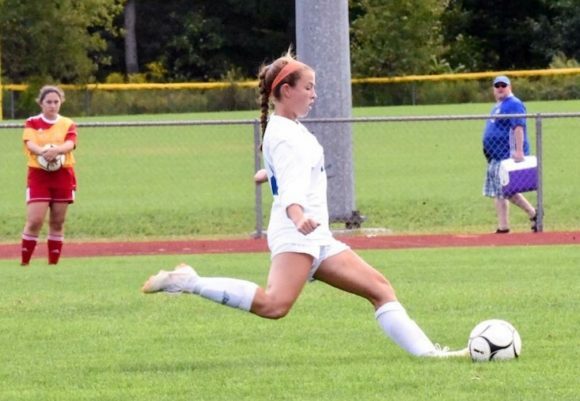 Mya Johnson scored both goals for Old Lyme in Friday’s game against Holy Cross. Yesterday afternoon, the Lyme-Old Lyme High School soccer girls continued their successful season with a 2-0 victory over Holy Cross. Mya Johnson scored both goals, one assisted by Kaylee Armenia. Sam Gray was in goal for Old Lyme and made four saves. In was Tori Schaffner was in goal for Holy Cross and notched six saves. Old Lyme is now 5-3-1 overall and 3-2-1 in the Shoreline Conference. Britney DeRoehn displays some deft footwork during today’s game. All photos by by Jennifer Alexander. Old Lyme blanked Westbrook 6-0 today at Westbrook High School. Kaylee Armenia scored one goal and had an assist. Kaylee Armenia put the ball in the net against Westbrook HS this afternoon. Both Britney DeRoehn and Melissa Mauro scored two goals each while Mya Johnson notched one goal and three assists. Britney DeRoehn scored two goals against Westbrook this afternoon. Danielle McCarthy also contributed an assist. Danielle McCarthy displayed her agility during the game. In goal for Old Lyme were Sam Gray and Grace Coverdale, neither of whom had to make any saves. 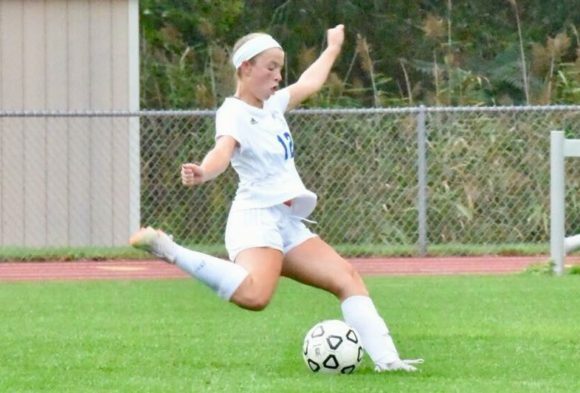 Mya Johnson not only scored a goal for Old Lyme but also contributed three assists. Lyme-Old Lyme Senior Captain Mya Johnson, who was named to the 2017-18 All-New England team, moves down the field with the ball in yesterday’s game. Photo by Jennifer Alexander. 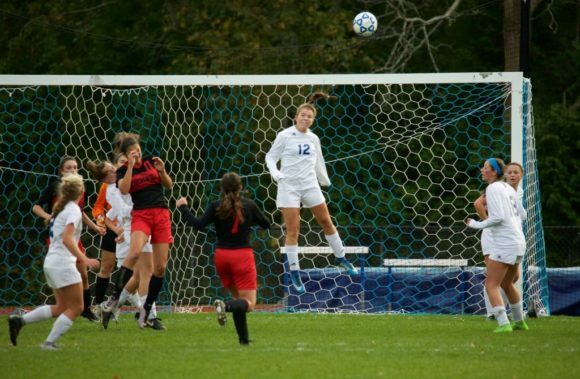 Paul Gleason’s Lyme-Old Lyme High School girls tied Portland 2-2 yesterday away at Portland High School. 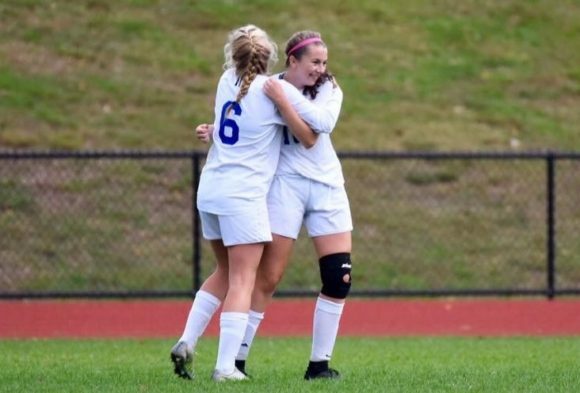 Mya Johnson and Caroline Wallace scored for Old Lyme with an assist from Danielle McCarthy. Olivia Smith was one of the scorers for Portland. Wildcat goalie Sam Gray made nine saves for Old Lyme while Kelly Boutin, who was in goal for Portland, notched six saves. Old Lyme is now 2-1-1 overall and 1-1-1 in the Shoreline Conference. 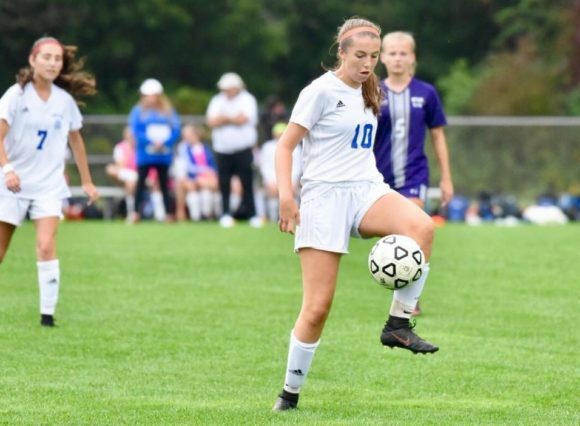 Playing away, the Lyme-Old Lyme High School girl’s soccer team lost to North Branford by a single goal in their first Shoreline Conference game of the season The Thunderbirds goal was scored by Lexi Rosado in the second half. The goal came against the run of play with Paul Gleason’s Wildcats having outshot their opponents by 15-3. Allie Augur was in net for North Branford notching 13 saves while Sam Gray defended the Old Lyme goal with two saves. Old Lyme is now 1-0-1 overall and 0-1 in the Shoreline Conference. From left to right, Morgan Greenho celebrates his Class S state doubles tennis victory with coach John Pfeiffer and partner George Danes. 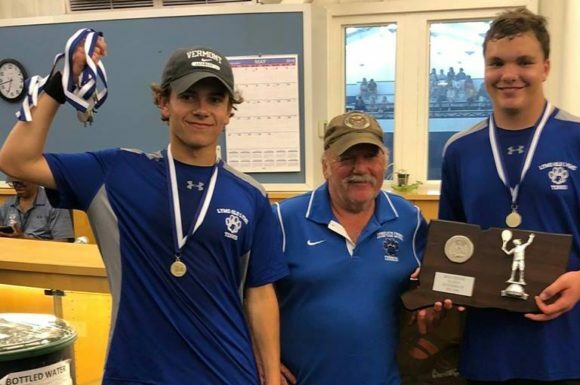 Last Thursday, Lyme-Old Lyme High School senior Morgan Greenho and freshman George Danes won the CIAC Class S boys’ tennis doubles championship at Yale. 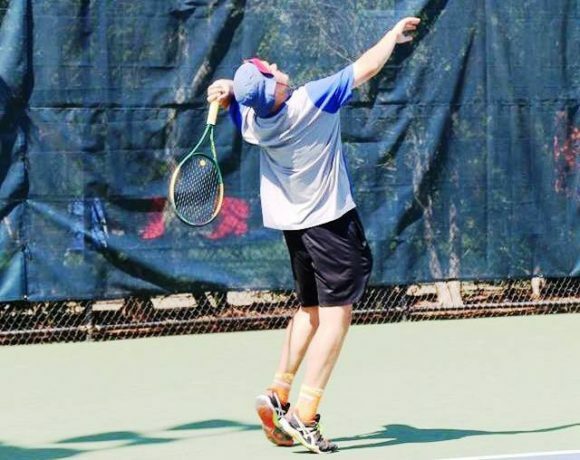 The pair, who were top seeds, defeated Patrick Markovics and Matthew Newfield of Morgan High School 6-3, 3-6, 6-4. Moment of victory! 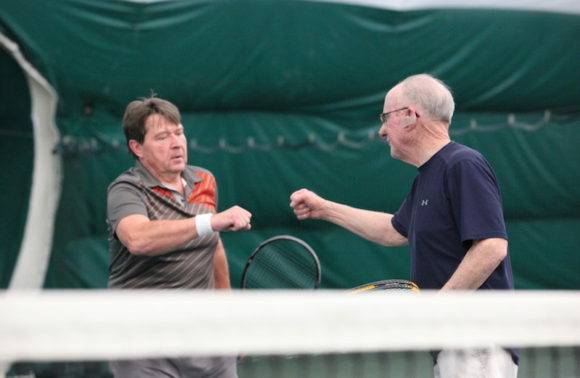 Morgan Greenho raises his arms in celebration while his doubles partner George Danes gives a thumbs-up sign. 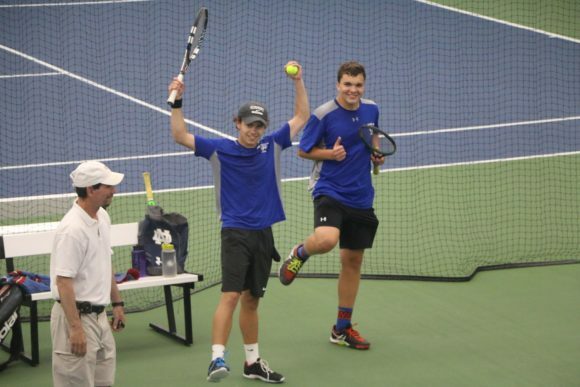 Old Lyme has not won the Class S doubles championship since Dane Pfeiffer and David Neaton’s success in 2003. Dane is the son of the current coach, John Pfeiffer. Reaching for the sky … or rather the ball! 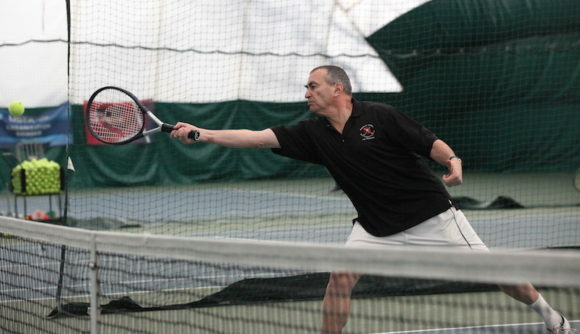 Sadly, Greenho and Danes lost on Saturday in the quarterfinals of the CIAC State Open at Amity, but despite that, the pair still enjoyed an extraordinarily successful season. Many congratulations to Morgan and George! The Old Lyme Wildcats celebrate their victory in the 2018 Shoreline Championship. Photo by L. Wallace. 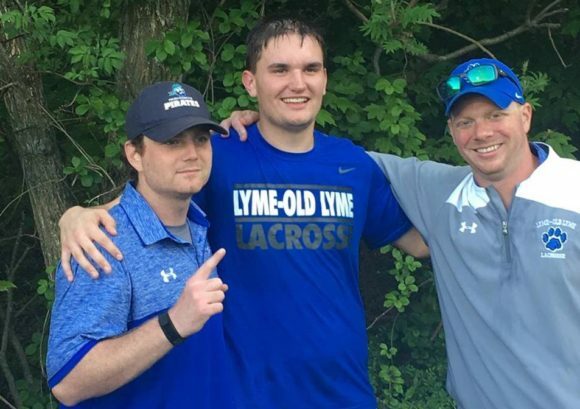 The second-seeded Old Lyme boys defeated #4 seeds Valley Regional by a single goal to win the Shoreline Conference championship game Thursday evening at the Indian River Sports Complex in Clinton. The final score in the thrilling game was 9-8. Key members of the Wildcats’ victorious 2018 Shoreline Conference Championship team. Photo by W. Visgilio. 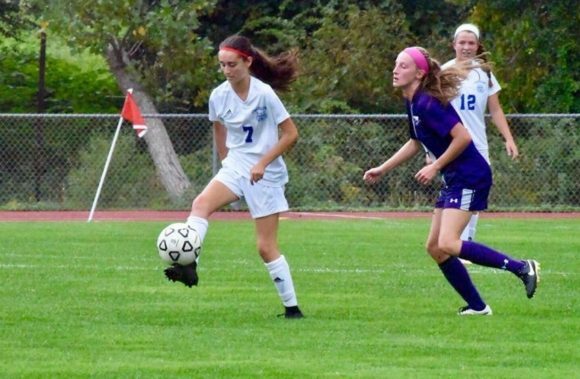 Sadly in the girls’ Shoreline Championship played earlier in the evening, the Old Lyme girls, who were also seeded second, fell 7-10 to top-seeded North Branford. Wildcat boys’ lacrosse coach JC Flaherty (right) celebrates his team’s victory in the 2018 Shoreline Championship. Hearty congratulations to boys’ coach JC Flaherty and his team, and commiserations to girls’ coach Emily Maccione and her team! Evan Visgilio stands proudly for a photo after winning a fistful of awards at the Vermont Special Olympics and being named Vermont Special Olympics Rookie of the Year. 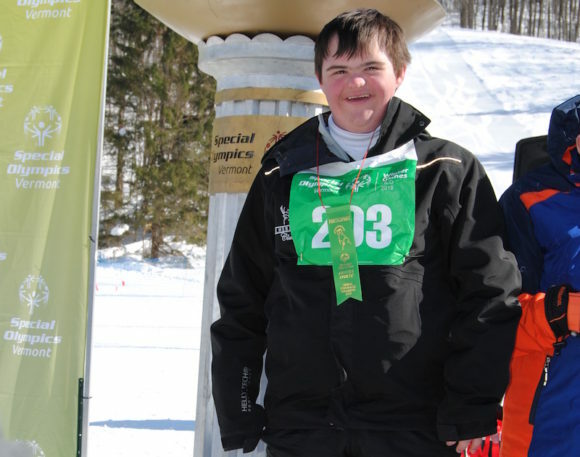 Evan Visgilio of Old Lyme returned from the Vermont Special Olympic Winter Games in Mendon, Vt., with a Participation Ribbon, a Seventh Place Finish and a Sixth Place Finish. 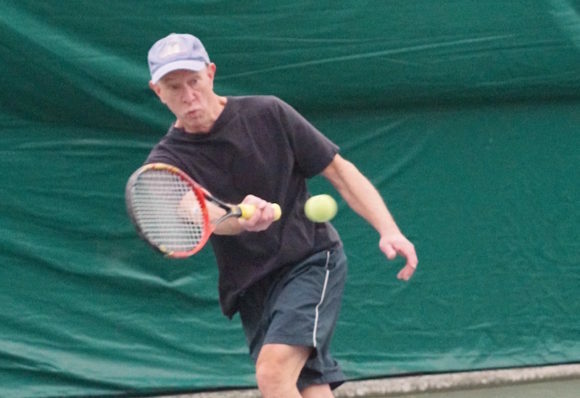 He was also named Vermont Special Olympics Rookie of the Year. Pico Mountain located in Mendon, Vt., hosted the Vermont Special Olympics Winter Games the weekend of March 19-20. Evan, who skies for The Hermitage at Haystack Team, participated in Slalom, Giant Slalom and Super G events, winning a Participation Ribbon in Slalom, a Seventh Place Ribbon in Giant Slalom and a Sixth Place Ribbon in the Super G. Evan advanced to Intermediate Division 3 this year. He was born with Down Syndrome and has been skiing for eight years. Evan, who is 14-years-old, lives in Old Lyme with his parents John and Wendy Visgilio, as well as his siblings Brenna, Will and John. Evan attends Lyme-Old Lyme Middle School where he is in 8th Grade. 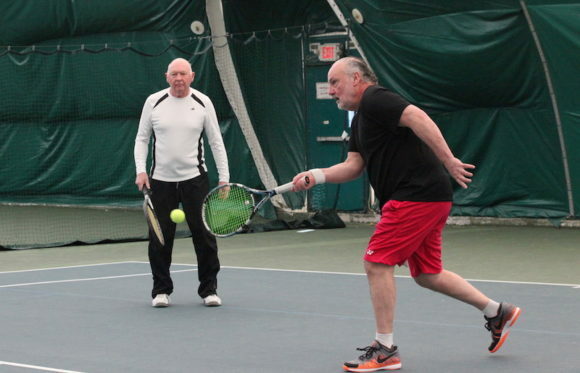 He trains at The Hermitage Club at Haystack Mountain in Wilmington, Vt., with his coaches Scott Serota, Corey Robinson and Kate Riley. 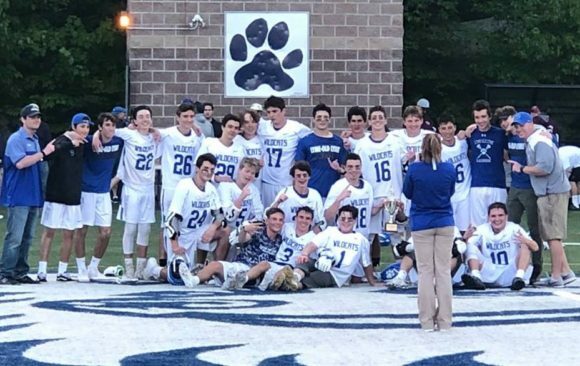 Defending champions Old Lyme face Holy Cross in the CIAC Class S state championship game today at 1 p.m. at Middletown High School. 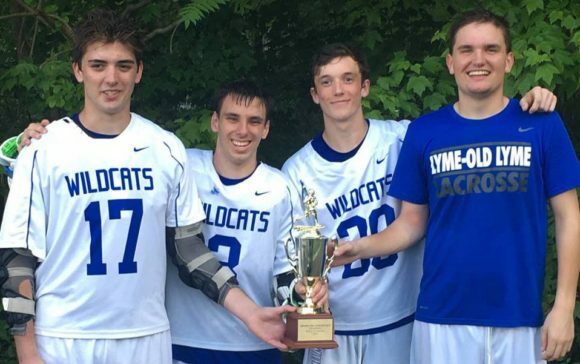 This is the third straight year that Old Lyme has played in the Class S championship — they came away with a draw in 2015, won 1-0 in 2016 … what will happen in 2017? Read a preview of this afternoon’s game by Vickie Fulkerson and published in The Day 11/17/17 at this link. Read a story about the Wildcat’s coach Paul Gleason by Mike DiMauro and published in The Day 11/16/17 at this link. Read a full report of the semi-final game against St. Paul by Mike DiMauro and published in The Day 11/15/17 at this link. Saving a goal! File photo of Wildcat Emily Rivera. 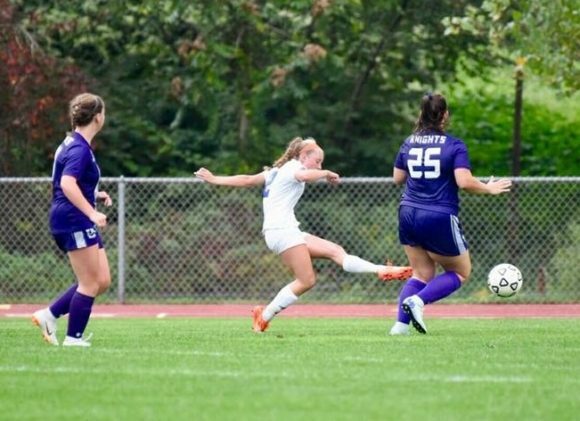 After the major disappointment of their loss in the Shoreline Conference final, Paul Gleason’s Wildcats are bouncing back in a big way. 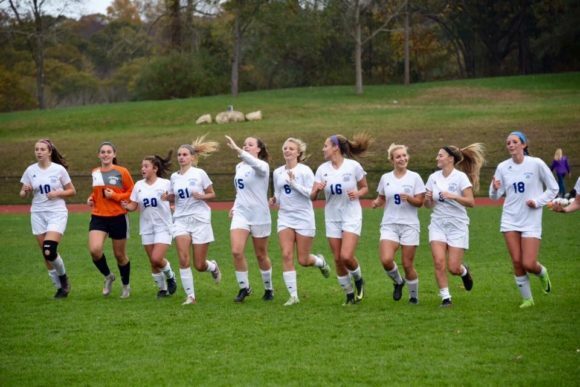 Yesterday they advanced to the semi-final of the Connecticut Interscholastic Athletic Conference (CIAC) Class S state tournament by crushing Coventry 2-1. Significantly, the “crushing” was not in the scoreline but rather in the fact that Old Lyme had scored both of its two goals within the first four minutes. Goal! File photo by Jennifer Alexander. Maddie Ouellette was first to score for Old Lyme with an assist from Danielle McCarthy. The team’s leading scorer Mya Johnson was the second to score unassisted. Coventry’s lone goal was scored by Alexa Stinson after 15 minutes. In goal for Old Lyme was Emily Rivera with three saves while Grace Galey made 10 saves for Coventry. Old Lyme advances to the semi finals on Tuesday against St. Paul with a 6:30 p.m. kick-off at Falcon Field in Meriden. High jump with a difference! Heading the ball away from the goal. All photos by Jen Alexander. 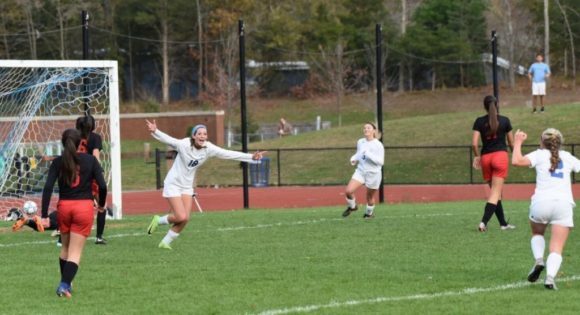 Continuing their unbeaten run, Old Lyme stormed into the Shoreline Conference final yesterday by soundly defeating Cromwell 3-0 in their semifinal game at Lyme-Old Lyme High School. Mya Johnson was the first to score with an assist from Maddie Ouellette. Caroline Wallace followed up with another assist from Maddie Ouellette and then Maddie Zrenda scored the third and final goal for Old Lyme on a penalty. 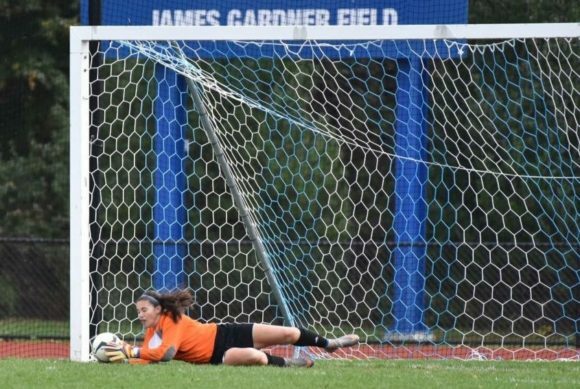 In goal for Old Lyme was Emily Rivera, who had seven saves for Old Lyme. Jessica DellaRatta was in net for Cromwell with 12 saves. Old Lyme is now 17-0-0 overall. The Shoreline Championship game will be held at at Portland High School on Saturday at 3 p.m. against the winner of the North Branford/Morgan game. Let’s hope we see these girls in another victory lap later this afternoon! 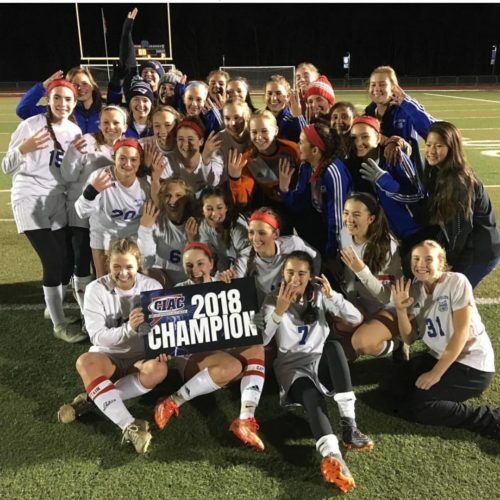 The top-seeded Old Lyme soccer girls (16-0-0) begin the defense of their Shoreline Conference title this afternoon in a semi-final game against Cromwell at home at 3 p.m. Yesterday’s planned semifinal game against the fourth-seeded Panthers (11-2-4) was postponed due to some lingering power outages in town and the challenging state of some roads due to the weekend storm. The unbeaten Wildcats (16-0) are not only reigning Shoreline champions, but also CIAC Class S champions. Come out and support the ‘Cats! GO WILDCATS!